The increasing availability of transcriptomic technologies within the last decade has facilitated high-throughput identification of gene expression differences that define distinct cell types as well as the molecular pathways that drive their specification. The retinal projection neurons, retinal ganglion cells (RGCs), can be categorized into distinct morphological and functional subtypes and by the laterality of their projections. Here, we present a method for purifying the sparse population of ipsilaterally projecting RGCs in mouse retina from their contralaterally projecting counterparts during embryonic development through rapid retrograde labeling followed by fluorescence-activated cell sorting. Through microarray analysis, we uncovered the distinct molecular signatures that define and distinguish ipsilateral and contralateral RGCs during the critical period of axonal outgrowth and decussation, with more than 300 genes differentially expressed within these two cell populations. Among the differentially expressed genes confirmed through in vivo expression validation, several genes that mark “immaturity” are expressed within postmitotic ipsilateral RGCs. Moreover, at least one complementary pair, Igf1 and Igfbp5, is upregulated in contralateral or ipsilateral RGCs, respectively, and may represent signaling pathways that determine ipsilateral versus contralateral RGC identity. Importantly, the cell cycle regulator cyclin D2 is highly expressed in peripheral ventral retina with a dynamic expression pattern that peaks during the period of ipsilateral RGC production. Thus, the molecular signatures of ipsilateral and contralateral RGCs and the mechanisms that regulate their differentiation are more diverse than previously expected. This study presents a new method for isolating ipsilaterally and contralaterally projecting retinal ganglion cells (RGCs) via retrograde labeling and fluorescence-activated cell sorting. 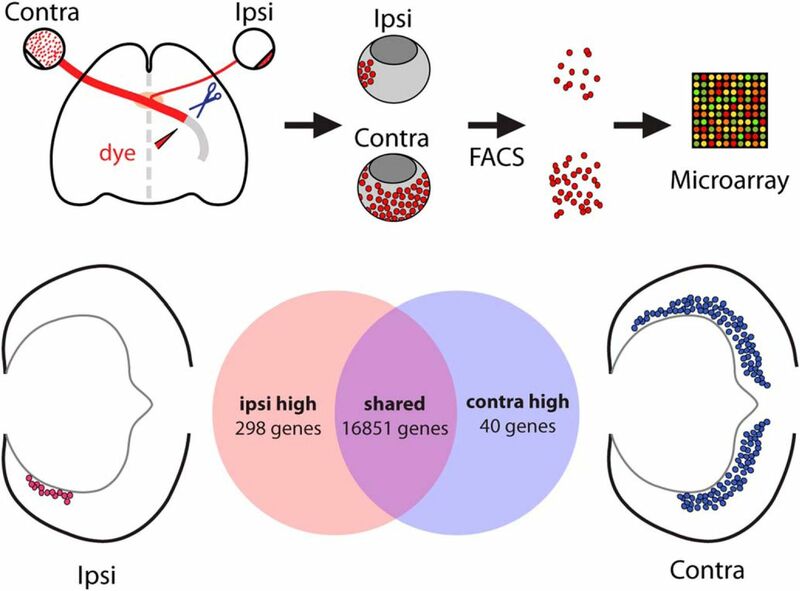 The subsequent transcriptomic analysis of these purified populations by microarray, followed by in vivo expression validation, revealed that ipsilateral RGCs have a distinct set of genes that govern neurogenesis, differentiation, and axon guidance compared with contralateral RGCs. Elucidating these gene programs contributes to our understanding of how decussating systems—in particular, the binocular circuit—are established. This information is critical for directing the appropriate RGC subtype differentiation and axon regeneration for repair after injury. The vertebrate central nervous system is composed of a complex network of highly diverse neurons defined by distinct molecular signatures that confer their unique properties in morphology, connectivity, and function. The vertebrate retina, with its three cellular layers and six neuronal classes, has been a useful model for studying general principles of neurogenesis and axon guidance. Each class of retinal cells can be further divided into morphologically and functionally distinct subtypes, and recent efforts have identified the molecular programs that establish these differences within neuronal classes, such as amacrine, bipolar, and retinal ganglion cell (RGC) subtypes (Kim et al., 2008; Badea et al., 2009; Kay et al., 2011a, 2011b; Watson et al., 2012; Jiang et al., 2013; Sajgo et al., 2014; Macosko et al., 2015; Osterhout et al., 2015; Sanes and Masland, 2015; Tang et al., 2015; Jin et al., 2015; Rousso et al., 2016; Shekhar et al., 2016). RGCs, as the only projection neurons of the retina, can be additionally distinguished by the laterality of their axonal projection to targets in the thalamus and midbrain. It is this decussation of the retinogeniculate projection that underlies binocular vision. Two different guidance programs direct the growth of the ipsilateral and contralateral projections at the mouse optic chiasm: EphB1 and EphrinB2 interactions repel ipsilateral axons from the midline, and an NrCAM/PlexinA1 complex reverses an inhibitory Sema6D signal to promote contralateral axon growth through the midline (Williams et al., 2003, 2006b; Kuwajima et al., 2012). Of the known retinal guidance receptors potentially regulated by these transcriptional programs, knockout mouse models show only partial changes in laterality (Williams et al., 2003, 2006a; Erskine et al., 2011; Kuwajima et al., 2012). Moreover, the molecular interactions between transcription factors (e.g., Zic2 and Islet2), downstream effectors (e.g., EphB1, Neuropilin, NrCAM, and PlexinA1), and upstream patterning genes (e.g., Foxd1 and Foxg1) within this genetic network have proven difficult to identify, suggesting the presence of yet-unknown intermediate players that bridge these gaps (Herrera et al., 2003, 2004; Pak et al., 2004; Pratt et al., 2004; Tian et al., 2008; Picker et al., 2009; Carreres et al., 2011; Fotaki et al., 2013; Hernandez-Bejarano et al., 2015). For example, in overexpression studies, Zic2 is more potent than EphB1 in switching RGC projection laterality (Petros et al., 2009b) and thus may regulate additional downstream factors in the uncrossed guidance program. Even less is known about the transcriptional regulators and adhesion molecules that mediate organization of eye-specific RGC axon cohorts in the optic tract and innervation of target regions. One approach to tackling these questions is to analyze the molecular signatures of ipsilateral and contralateral RGCs to identify genes specific to these two RGC subtypes. Such an approach has proven useful in recent studies of other neuronal subtypes, such as cortical projection neurons (Lodato and Arlotta, 2015), and has been particularly successful in uncovering transcriptional networks that regulate postmitotic cell fate acquisition. An unbiased screen allows for identification of new candidates not previously described in other systems and not ascribed to the retina or RGCs. A challenge to such studies is that ipsilateral RGCs constitute a very small population of cells within the retina [only ∼3–5% of the final RGC number and ∼10% at embryonic day 16.5 (E16.5)]. Thus, the ipsilateral RGC population is particularly sensitive to contamination by other cell types when using anatomical isolation approaches. Here we present a novel method for purifying embryonic ipsilateral and contralateral RGCs using retrograde labeling of live tissue coupled with fluorescence-activated cell sorting (FACS). Through gene expression profiling of purified ipsilateral and contralateral RGCs during the critical period of axon outgrowth and midline decussation, we have uncovered distinct molecular signatures that define and distinguish these two RGC cohorts during embryonic development. Through subsequent validation of the in vivo expression patterns of select candidates, we have identified more than 300 genes that are differentially expressed in ipsilateral and contralateral RGCs. Ipsilateral RGCs are enriched in “early” genes, in particular transcription factors known to be expressed by retinal progenitor cells. Of special interest is the expression of cyclin D2, a cell cycle–related gene highly abundant in ventral retina. In addition, we observed the expression of potential molecular partners in a complementary fashion within ipsilateral and contralateral RGCs. Although several important studies have identified genes that distinguish neuronal subtypes defined by their connectivity or neurotransmitter expression, this is the first attempt at using gene profiling to investigate the differences between two neuronal subtypes distinguished by the laterality of their projection. C57/BL/6J mice were obtained from the Jackson Laboratory (Bar Harbor, ME) and are referred to as wild-type in this study. In Foxd1lacZ/+ and Foxd1lacZ/lacZ mice, the lacZ gene was substituted for the coding region of Foxd1 (Hatini et al., 1994). Mice were housed in a barrier facility in a timed-pregnancy colony at Columbia University and exposed only to conditions and procedures that were approved by the Institution Animal Care and Use Committee, protocol numbers AAAG8702 and AAAG9259. Females were checked for vaginal plugs at approximately noon on every weekday. Conception was assumed to take place at midnight, and E0.5 refers to the day on which the vaginal plug was detected. Tetramethylrhodamine-conjugated dextran MW3000, anionic, lysine fixable (D-3308; Invitrogen, San Diego, CA) was used to retrogradely label retinal ganglion cells. Pregnant females were anesthetized using ketamine-xylazine (100 and 10 mg/kg, respectively, in 0.9% saline). While the mother was kept alive, each E16.5 embryo was removed from the uterus and decapitated in DMEM/F12 (Invitrogen) buffer over ice. The head was immersed in DMEM, and hard palate and skull base were removed to expose the optic chiasm and tract. The optic tract and surrounding tissue were dried, and a pinch of dextran was applied to the severed optic tract with forceps. Heads were then incubated in pre-oxygenated bubbling artificial CSF at room temperature for 2 hours. For FACS experiments, retinas were immediately dissected out without fixation and were screened for labeling with rhodamine in the expected domains for ipsilateral and contralateral RGCs. Only retina pairs with robust and specific rhodamine labeling were processed for FACS. For whole-mount preparations, labeled heads were fixed in 4% PFA in 0.1 m phosphate buffer (PB) at 4°C overnight and rinsed in PBS. Retinas were then dissected and flat-mounted on coverslipped slides with Fluoro-Gel (Electron Microscopy Sciences, Hatfield, PA). Dissected ipsilateral or contralateral retinas were digested in papain solution (20 U/mL in Earle’s balanced salt solution, Worthington, Freehold, NJ) followed by repeated trituration in DMEM/F12 + 10% fetal bovine serum + DNaseI. Dissociated cells were washed with PBS, resuspended in PBS + 2% fetal bovine serum, passed through a 0.45-µm cell strainer, and kept on ice before and throughout flow cytometry. Rhodamine-positive neurons, with exclusion of DAPI-stained dead cells, were collected using a BD FACSAria cell sorter in the Columbia University Cancer Research Center core facility. RNA purification was performed immediately after FACS using the Absolutely RNA Nanoprep kit (Stratagene, La Jolla, CA). RNA concentration was determined using the RNA 6000 Pico kit (Agilent Technologies, Santa Clara, CA) with the Agilent 2100 Bioanalyzer and stored at –80°C. Amplified cDNA was generated from purified RNA using Ovation Pico WTA System (Nugen, San Carlos, CA) and labeled and fragmented using the Encore Biotin Module (Nugen). For each round of FACS isolation, the same amount of starting RNA extracted from the ipsilateral or contralateral RGC populations was used for cDNA amplification. Labeled cDNA (5 μg) was hybridized on Mouse Genome 430 2.0 Array chips (Affymetrix, Santa Clara, CA), and analyzed using GeneSpring GX11 (Agilent Technologies). Differentially expressed genes were identified from three biological replicates (three independent rounds of retrograde labeling and FACS) by greater than two-fold change and corrected p < 0.05, Benjamini–Hochberg. Microarray data was deposited in NCBI’s Gene Expression Omnibus and are accessible through GEO series accession number GSE83461 (https://www.ncbi.nlm.nih.gov/geo/query/acc.cgi?acc=GSE83461). cDNA from E14–E16 retina was retrotranscribed from purified RNA using Superscript III Reverse Transcriptase (Invitrogen). Quantitative PCR (qPCR) was performed using a Stratagene MX3000 with the SYBR Green PCR Kit (Applied Biosystems, Foster City, CA). Transcript levels were normalized to that of HPRT. qPCR-specific primers (Table 1) were designed using the Primer3 program. Primers used in qRT-PCR and for generating in situ hybridization probes. Plasmids for making in situ hybridization (ISH) probes were generated for select microarray candidates. cDNA sequences were obtained from NCBI, and PCR primers for generating ∼500-bp riboprobe sequences were selected using Primer-BLAST. 3′ sequences of the gene were targeted if possible (Table 5). Template cDNA was synthesized from RNA purified from E14–E16 retina using Superscript III Reverse Transcriptase (Invitrogen), and gene product was generated with targeted oligos and Platinum Pfx polymerase (Invitrogen). PCR product was purified using QIAquick PCR Purification kit (Qiagen, Hilden, Germany), inserted into pCR-Blunt II-TOPO vector using Zero Blunt Cloning kit (Invitrogen), and transformed into TOP10 or DH5α cells. Purified plasmids were linearized using restriction enzyme with overnight incubation at 37°C. Riboprobes were synthesized using the Digoxigenin RNA labeling mix (Roche, Basel, Switzerland). The following probe plasmids were obtained from other laboratories: Math5 (L. Gan, University of Rochester), Sema3e (A. Kolodkin, Johns Hopkins University), and Tbx20 (G. Papaioannou, Columbia University). Embryos were collected at E13.5, E15.5, or E16.5 in PBS on ice. Heads were decapitated in PBS over ice, fixed in 4% paraformaldehyde (PFA) in 0.1 m PB at 4°C overnight, rinsed in PBS at least three times for a minimum of 1 h total at 4°C, and cryoprotected in 30% sucrose in 0.1 m PBS for 1–2 nights at 4°C. Coronal sections (14-µm) were collected through the retina and immediately processed for ISH (or stored at –80°C) using a protocol adapted from Schaeren-Wiemers and Gerfin-Moser (1993). After ISH, tissues were fixed for 30 min in 4% PFA, washed with PBS, and processed for immunostaining with Zic2 and Islet1/2 antibodies. The following primary antibodies were used: rabbit anti-Zic2 (RRID:AB_2315623, gift of Stephen Brown, 1:10,000), mouse anti-Islet1/2 (cat. # 39.4D5, RRID:AB_528173, gift of Thomas Jessell, 1:50; this antibody was raised against Islet1 but also reacts with Islet2), rabbit anti-cyclin D2 (Santa Cruz Biotechnology, Santa Cruz, CA, cat. # sc-452, RRID:AB_627350, 1:1000), rat anti-cyclin D2 (Santa Cruz Biotechnology, cat. # sc-593 RRID:AB_2070794, 1:50), goat anti-Brn3 (Santa Cruz Biotechnology, cat. # sc-6026 RRID:AB_673441, 1:200), and mouse anti-Brn3a (EMD Millipore, Billerica, MA, cat. # MAB1585 RRID:AB_94166, 1:200). The following secondary antibodies were used: donkey anti-rabbit Alexa Fluor488 (Invitrogen, 1:400), donkey anti-mouse Alexa Fluor 488 (Invitrogen, 1:400), donkey anti-goat Alexa Fluor 488 (Invitrogen, 1:400), donkey anti-mouse Cy3 (Jackson Immunoresearch, West Grove, PA, 1:500), donkey anti-rabbit Cy3 (Jackson Immunoresearch, 1:500), donkey anti-goat Cy5 (Jackson Immunoresearch, 1:200), and donkey anti-rat Cy3 (Jackson Immunoresearch, 1:500). Embryos were collected at the age of interest in PBS on ice. Heads were decapitated in PBS over ice, fixed in 4% PFA in 0.1 m PB for 1 h at 4°C, rinsed in PBS at least three times, washed in PBS for a minimum of 1 h at 4°C, and cryoprotected in 10% sucrose in 0.1 m PBS for 1–2 nights at 4°C. Heads were embedded in optimal cutting temperature compound over crushed dry ice and stored at –80°C. 12 μm coronal sections were collected for cyclin D2 immunostaining; 16- to 20-µm coronal sections were collected for all other stainings. For immunohistochemistry (IHC), slides were blocked in 10% normal goat serum (NGS) and 0.2% Triton X-100 in PBS for 1 h, incubated with primary antibody in 1% NGS and 0.2% Triton X-100 in PBS overnight at 4°C, washed three times for 20 min in PBS at room temperature, incubated in secondary antibody in 1% NGS and 0.2% Triton X-100 in PBS overnight at 4°C, and washed in PBS three times for 20 min each. Coverslips were mounted on slides with Fluoro-Gel. ISH and whole-mount preparations (anterograde and retrograde labeling) were taken by Axiovision software with an Axiophot camera connected to a Zeiss Axioplan2 microscope. IHC preparations were imaged using a Zeiss AxioImager M2 microscope equipped with Apotome, AxioCam MRm camera, and Neurolucida software (V10.40, MBF Bioscience, Williston, VT). To identify genes that distinguish ipsilateral and contralateral RGCs during early development through gene expression profiling, pure populations of these two RGC subpopulations from mouse embryonic eyes are needed. To accomplish this, we devised a method of combining retrograde axonal tracing from the optic tract with FACS. In this procedure, the optic tracts are accessed by removal of the palate and exposure of the ventral brain in an isolated head preparation. We then cut the optic tract unilaterally and applied to the cut site a fluorophore-conjugated dextran, which is subsequently transported retrogradely to RGC somas within the ipsilateral or contralateral retina (Fig. 1A). Traditional retrograde labeling approaches for the visual system require long overnight incubations for dye transport. We surveyed a number of commonly used retrograde tracers (including cholera toxin B and dextrans of various molecular weights) and devised a protocol for retrogradely labeling RGCs using rhodamine-dextran 3000 within 2 hours of dye application. These conditions are optimal for preserving tissue health for subsequent cell sorting experiments. As expected, the RGCs labeled within the ipsilateral retina were located in the ventrotemporal (VT) peripheral crescent, whereas extra-VT RGCs were labeled in the contralateral retina as seen in whole mounts (Fig. 1B) and cross-sections (Fig. 1C). The fluorescence signal within labeled retinas from two E16.5 litters (12–15 embryos total) was examined, and only retinal pairs with specific and sufficient RGC labeling were used for cell sorting (Fig. 1D). FACS purification of retrogradely labeled mouse retinal ganglion cells at E16.5. A, Schematic of retrograde labeling and cell purification methods for microarray analysis. Diagram of the ventral view of embryonic brain depicts application of rhodamine dextran 3000 MW dye (RD3000) to a unilateral transected optic tract. B, Whole-mount preparations of E16.5 retina. RD3000 fully labels axons and cell bodies of E16.5 RGCs within 2 hours of incubation after dye application to the optic tract. Extra-VT RGCs are labeled in retina contralateral to labeled optic tract and VT RGCs are labeled in the ipsilateral retina. C, Coronal vibratome sections of E16.5 retina retrogradely labeled with RD3000 show specific labeling of contralateral and ipsilateral RGCs in their respective retinal domains (VT domain marked with white bracket). D, Fresh E16.5 retinas are screened for appropriate RD3000 labeling of ipsilateral and contralateral RGCs before FACS. E, FACS purification of ipsilateral and contralateral RGC populations retrogradely labeled with RD3000 with DAPI exclusion of nonviable cells. ∼3000 ipsilateral and ∼20,000 contralateral RGCs (P4 gate) are purified from two litters of E16.5 embryos. F, Cells purified by FACS are enriched in RGC marker Islet1/2 compared with presorting. G, Zic2 and SERT are enriched in the ipsilateral RGC cell population isolated by FACS compared with the contralateral RGCs. D, dorsal, V, ventral, N, nasal, T, temporal. Scale bars, 250 μm. Pooled ipsilateral and contralateral retinas (8–10 each) were dissociated to obtain a single-cell suspension, and rhodamine-dextran–positive cells were then isolated by FACS. Two litters of retrogradely labeled embryos yielded approximately 3000 FACS events for the ipsilateral population and 20,000 for the contralateral (Fig. 1E). Plating of cells before and after FACS shows enrichment in cells that stain positively for Islet1/2, a marker of differentiated RGCs (Fig. 1F). RGCs were immediately lysed for RNA isolation after FACS, with total time from removal of embryo for retrograde labeling to post-FACS RNA isolation being 8–9 hours. Subsequent qPCR analysis showed that rhodamine-labeled RGCs from ipsilateral retinas express high levels of Zic2 and SERT compared with those from contralateral retinas (Fig. 1G). Thus, rapid retrograde labeling from the optic tract ex vivo followed by FACS is a clean and effective way for purifying ipsilateral and contralateral RGCs during development. We next conducted expression profiling of ipsilateral and contralateral RGC populations purified using the above methods. Because of the small number of ipsilateral RGCs isolated with this method, cDNA prepared from FACS-isolated ipsilateral and contralateral RGCs was amplified before gene chip hybridization. The three biological replicates from independent rounds of retrograde labeling and FACS that showed the most robust enrichment in Zic2 expression in ipsilateral RGCs by qPCR were selected for microarray analysis. For each round of FACS, paired ipsilateral and contralateral RGCs underwent the same treatment conditions and sample preparation methods. Gene ontology analysis of microarray results (GEO series accession number GSE83461) revealed that many differentially expressed genes are involved in developmental processes, including regulation of gene expression, cell proliferation, cell cycle progression, and cell differentiation (Table 4). Most genes were expressed at similar levels in ipsilateral and contralateral RGC samples, including the pan-RGC transcription factors Brn3b and Islet1 (Pan et al., 2008). However, 338 genes were differentially expressed in the two populations by two-fold or more (corrected p-value <0.05, Benjamini–Hochberg; Fig. 2A, B, Table 5) and included genes known to be enriched in ipsilateral RGCs such as Zic2 (5.78-fold) and SERT (4.49-fold), as well as contralateral RGC marker Brn3a (2.20-fold). The other known contralateral RGC marker, Islet2, was elevated by only 1.5-fold and did not make the two-fold cutoff; however, this may be because Islet2 is expressed in only a subset (∼33%) of contralateral RGCs (Pak et al., 2004). Microarray analysis of ipsilateral and contralateral RGCs purified at E16 reveals distinct expression profiles. A, Microarray analysis reveals 298 and 40 unique genes at least two-fold increased in ipsilateral or contralateral RGCs, respectively (p ≤0.05, Benjamini–Hochberg correction). B, Distribution of differentially expressed genes shows that the majority are upregulated in ipsilateral RGCs. The microarray gene list also included genes not previously characterized with regard to their differential expression in RGC subpopulations, most of which were elevated in ipsilateral RGCs (Fig. 2A). In total, 298 genes (404 probe sets) were found to be enriched in ipsilateral RGCs and 40 genes (47 probe sets) in contralateral RGCs, using a two-fold cutoff (Fig. 2, Table 5), suggesting that an extensive genetic program is activated to generate ipsilateral RGCs. An alternative explanation for these findings is that because ipsilateral RGCs reside in a more spatially restricted domain within the retina, some of these genes may have region-specific expression patterns. Moreover, contralateral RGCs represent a much larger cellular population than ipsilateral RGCs in mice, and subsets of contralateral RGCs themselves may have diverse gene expression profiles. Thus, genes that are expressed exclusively in a subset of contralateral RGCs may have been thus missed by our analysis, as in the case of Islet2. For validation of the microarray, we analyzed the expression levels of 11 new gene candidates (nine ipsilateral high and two contralateral high) in FACS-derived RGCs by quantitative RT-PCR. Of these 11 genes, 10 (all but Otx2) were enriched in the RGC subpopulation as seen by gene profiling, demonstrating interplatform reproducibility of the gene expression detection by microarray (Table 2). In summary, gene profiling of purified ipsilateral and contralateral RGCs at E16.5 revealed that these two RGC subsets are defined by unique molecular signatures and provided an extensive list of candidate genes that may be differentially expressed in these two cell populations. qRT-PCR validation of select microarray candidates shows interplatform reproducibility. To validate the expression of candidate genes in vivo, we used ISH and IHC, which provide information regarding the spatiotemporal pattern of expression as well as colocalization with known ipsilateral or contralateral RGC markers, such as Zic2, SERT, and Brn3a (Fig. 3). The primary purpose of this microarray screen was to identify additional regulators of axon guidance at the midline and target, including guidance molecules and transcription factors, other genes that functionally distinguish ipsilateral and contralateral RGCs, and finally, genes that specify ipsilateral and contralateral RGC fate. Thus, of the 339 differentially expressed genes, we focused on five groups: transcription factors involved in neuronal development (e.g. Sox2, Lhx2, Math5, Tbx20), signaling pathways prominent during development (e.g. Igf1, Igfbp5, Fgf12, Ptch1), axon guidance–related genes (e.g. Sema3e, Sema4d, Sema5b, Sema7a), cell cycle regulators (e.g., Ccnd1, Ccnd2), and other cell-surface or secreted molecules that may be related to cell differentiation (e.g., Gja1, Sparc, Zip6/Liv-1, Napb). Representative genes of these groups are shown in Table 3. Representative genes that are differentially expressed in ipsi- and contralateral RGCs. Gene ontology analysis of differentially expressed genes. Genes differentially expressed in ipsilateral versus contralateral RGCs. Expression patterns of known ipsilateral and contralateral RGC genes. 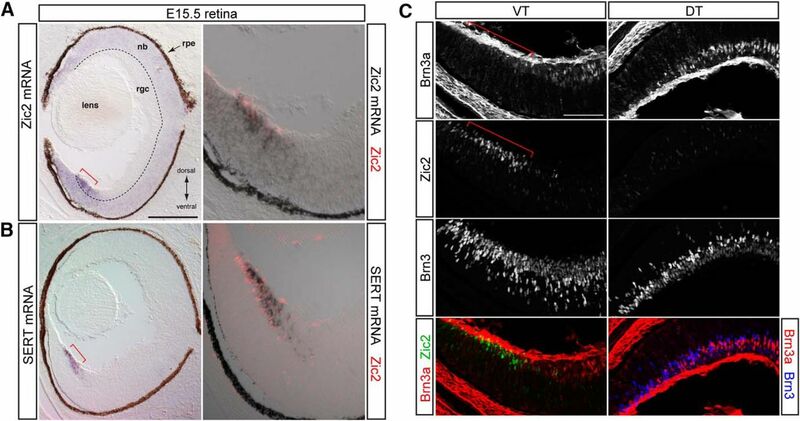 Combined ISH and IHC analysis at E15.5 shows colocalization of Zic2 protein expression with Zic2 (A) and SERT (B) mRNA in ipsilateral RGCs in the VT retina. C, In contrast, contralateral RGC marker Brn3a shows complementary expression to Zic2 in immunostained sections in which all RGCs are labeled with a pan-Brn3 antibody. These patterns of expression were used as standards for expression analysis of microarray gene candidates. rpe, retinal pigment epithelium; nb, neuroblast layer; rgc, retinal ganglion cell layer; DT, dorsotemporal retina; VT, ventrotemporal retina. Scale bars, 250 μm (A and B) and 100 μm (C). At present, very few specific markers of contralateral RGCs have been identified, and no gene has been shown to specify contralateral identity throughout the retina. To confirm that select candidate genes are indeed specifically expressed in contralateral RGCs, we analyzed the mRNA expression pattern of the gene of interest at E15.5 (peak of Zic2 expression) by ISH followed by co-immunostaining with ipsilateral RGC marker Zic2 and pan-RGC marker Islet1/2 within the same sections. We selected these seven genes based on the magnitude of their fold change (Napb, Bmper, and Igf1 were the most highly enriched in contralateral RGCs) as well as their potential function during development as predicted by their known functional classification roles in other systems. Of the seven new contralateral genes tested, the following genes showed exclusive expression in contralateral RGCs (Islet1/2+Zic2– cells): transcription factor Tbx20, cell surface/secreted protein Sema3e, and growth factor Igf1 (Fig. 4A–C). Fgf12 is also enriched in RGCs outside of the Zic2+ zone and shows only weak expression in VT RGCs (Fig. 4D). Interestingly, Fgf12 and Igf1 expression is weaker in the most peripheral RGCs of dorsotemporal (DT) retina, suggesting that the youngest DT RGCs (Fig. 4C, D, adjacent to dashed red line) have not yet accumulated as much of these transcripts as the more central RGCs. Tbx20 and Sema3e are even more centrally expressed and appear to have more mosaic expression. None of these genes have been studied in the context of RGC development or contralateral RGC function. Together, Igf1, Fgf12, Tbx20, and Sema3e represent four new contralateral RGC markers during the peak period of axon outgrowth, when ipsilateral and contralateral RGC axons diverge. Genes enriched in the contralateral RGC population. ISH analysis at E15.5 shows complementary expression of Tbx20 (A), Sema3e (B), and Igf1 mRNA (contralateral RGCs) with Zic2 (ipsilateral RGCs). Fgf12 is highly expressed in Zic2– RGCs, with only trace levels of expression in Zic2+ cells. All candidate genes are expressed in Islet1/2+ (differentiated) RGCs. Scale bars, 250 μm. To validate the expression pattern of genes enriched in ipsilateral RGCs in the microarray, we again used ISH analysis on coronal sections of E15.5 retina, co-immunostaining for RGC markers. Here, we selected transcription factors that participate in CNS development as discussed above, as well as cell cycle regulators, developmental signaling molecules, axon guidance molecules, and other secreted or membrane-expressed genes that may play a role in differentiated RGC function. Of the 23 new ipsilateral genes tested, many were expressed in proliferative zones within the retina, as expected. However, three genes, Sox2, Math5, and Igfbp5, were additionally expressed in differentiated ipsilateral RGCs. We also detected four other genes, Lhx2, Zic1, Gja1, and Ccnd2, that were expressed in ipsilateral RGCs either at a weaker level or within a more limited developmental window (data not shown). The most striking expression pattern of this group of validated genes is that of insulin-like growth factor binding protein 5 (Igfbp5). Igfbp5 is expressed in RGCs of the Zic2+ RGC zone throughout the VT retina (Fig 5A). Closer examination reveals that Igfbp5 is most strongly expressed in Zic2+Islet1/2+ RGCs of this region, but not all Zic2+ RGCs express Igfbp5, and some Zic2– cells also express lower levels of Igfbp5 and are located at the junction between the RGC and neuroblastic layers (Fig. 5A, high power). Igfbp5 is also expressed in the most peripheral contralaterally projecting RGCs (Zic2–Islet1/2+) of DT retina, although these cells are much fewer than the VT RGCs that express Igfbp5. Interestingly, Igfbp5+ cells correspond to the most peripheral DT RGCs that lack Igf1 expression (Fig. 5B). Thus, Igfbp5 and Igf1 have a complementary pattern of expression in E15.5 retina, suggesting that these two components of the Igf signaling pathway have complementary or antagonistic functions at this age. Igfbp5 is expressed in the VT RGC zone in Zic2+ cells. ISH analysis at E15.5. A, Igfbp5 mRNA is expressed in a subset of Zic2+ RGCs in VT retina (red arrows) and a few Zic2– RGCs in dorsal retina. Red brackets mark the ipsilateral RGC domain. B, Igfbp5 (red brackets) and Igf1 are expressed in a complementary pattern throughout the retina. C, Igfbp5 expression is concomitantly reduced in the Foxd1 KO mutant compared with WT littermates; this reduction correlates with the similar reduction in Zic2 expression in the VT retina of the Foxd1 KO mutant. Red brackets mark the expected ipsilateral RGC domain. Scale bars, 250 μm. To determine whether Igfbp5 is truly related to ipsilateral RGC identity, we studied the expression of Igfbp5 in the Foxd1 knockout, in which the patterning of the region containing ipsilateral RGCs is disrupted with concomitant loss of Zic2-expressing RGCs. Indeed, Igfbp5 coexpression within RGCs is reduced within the VT retina (Fig. 5C), suggesting that Igfbp5 is not merely expressed in the peripheral-most RGCs but rather is uniquely upregulated within ipsilateral RGCs. A large group of genes enriched in ipsilateral RGCs in the microarray were transcription factors known to be important in the development of retinal progenitor cells or RGC precursors. Two possible explanations for this finding include: (1) the ipsilateral RGC sample is disproportionately contaminated with RNA from proliferating cells, or (2) these genes are indeed enriched in ipsilateral RGCs. In support of the latter scenario, two ipsilateral RGC-enriched microarray candidates, Sox2 and Math, show clear expression in both progenitor cells and differentiated RGCs (Fig. 6A, B). Sox2 is expressed in neuronal progenitors during CNS development, including the retina, but is downregulated during the final division as the progenitor becomes postmitotic (Pevny and Nicolis, 2010). Indeed, we observed homogeneous Sox2 expression within the proliferative regions of retina, i.e., the neuroblastic layer progenitors, ciliary body progenitors (Fig. 6A), and optic nerve head glial progenitors (not shown). Remarkably, Sox2 is also expressed homogeneously and at an overall stronger level within the Zic2+ VT RGC zone and colocalizes with Zic2 and Islet1/2 expression. Sox2 is completely absent from DT RGCs, indicated by Islet1/2 expression, including the most peripheral cells. Thus, Sox2 mRNA expression is maintained in postmitotic Zic2+ RGCs and, similar to SERT, is a distinct marker of this RGC subset. Sox2, Math5, and cyclin D2 are enriched in the ipsilateral RGC population in addition to progenitor cells throughout the retina. ISH analysis at E15.5. 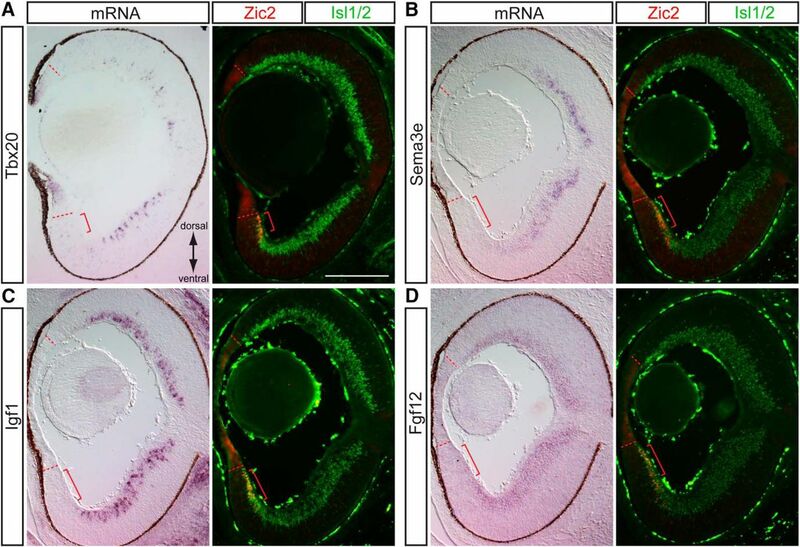 A, Sox2 mRNA is expressed in the neuroblastic layer and Zic2+ RGCs but not Zic2–/Islet1/2+ (differentiated) RGCs extra-VT retina. B, Similarly, Math5 mRNA is expressed in Zic2+ RGCs located at the periphery of the VT retina in the RGC layer as well as in RGC precursors in the neuroblastic layer (red arrows). C, Cyclin D2 mRNA is expressed in the basal process of cells within the peripheral margin of the retina, particularly in the ventral retina, and also at low levels in the Zic2+ RGC zone at E15.5. D, The asymmetric expression of cyclin D2, with higher levels in ventral retina, is more pronounced at E13.5. Red brackets mark the Zic2+ ipsilateral RGC domain. Scale bars, 250 μm. The transcription factor Math5 is expressed in retinal progenitors after they acquire competence to generate RGCs (Wang et al., 2001; Brzezinski et al., 2012) and thus marks the first neurogenic competence state of retinal progenitors (Yang et al., 2003). Similar to Sox2, Math5 mRNA expression extends into the Zic2+ RGC zone. However, unlike the homogeneous expression of Sox2, Math5 colocalizes with Zic2 expression predominantly in peripheral RGCs (Fig. 6B, red arrows indicate Zic2+ nucleus in red with surrounding Math5 mRNA in black). This colocalization is not as pronounced in RGCs in DT retina. Sox2 and Math5 expression patterns indicate that ipsilateral RGCs retain the expression of genes initially expressed before differentiation. This may be due to an upstream regulatory program that differs between ipsilateral and contralateral RGCs, turning off the expression of progenitor genes within contralateral RGCs but allowing for their continued expression in ipsilateral RGCs. These results raise the intriguing question of why Zic2+ ipsilaterally projecting RGCs maintain the expression of such genes. Interestingly, we detected a number of cell cycle regulators enriched in ipsilateral RGCs in our microarray screen. In particular, the G1 cyclin D2 stood out as an interesting candidate, as its function has not been previously examined in the retina due to the lack of a gross retinal phenotype in cyclin D2 null mice (Sicinski et al., 1996). In contrast, mice without cyclin D1, which is the predominant G1 cyclin during retinal development, have severely hypocellular retinas (Fantl et al., 1995; Sicinski et al., 1995; Dyer and Cepko, 2001; Geng et al., 2001; Das et al., 2009). In our ISH studies, cyclin D2 (Ccnd2) is expressed asymmetrically in the proliferating cells peripheral to the RGC zone at E15.5, with a higher level and broader zone of expression in ventral retina compared with dorsal retina (Fig. 6C; see also Trimarchi et al., 2009). Moreover, lower levels of cyclin D2 mRNA expression extend into the Zic2+ RGC zone but can also be detected at a lower level within the entire span of the Zic2+ RGC zone (Fig. 6C, inset). The asymmetry in expression and extension of the cyclin D2 domain into the Zic2+ RGC zone are even more pronounced at E13.5 (Fig. 6D). Because of the localization of Ccnd2 mRNA to the basal process of these cells, which has been previously described in the cortex (Tsunekawa et al., 2012), we are unable to determine whether Cyclin D2 mRNA and Zic2 protein expression colocalize in the same cells. To determine cyclin D2 protein localization throughout development, retinal sections from E11.5, 13.5, 14.5, 15.5, and E16.5 embryos were immunostained with antibodies against cyclin D2, Zic2 (ipsilateral RGCs), and Brn3 (all RGCs). Consistent with the ISH results, IHC analysis showed that cyclin D2 is expressed within the retinal periphery and the optic nerve head, and its expression is substantially higher in ventral than in dorsal periphery until E15.5 (Fig. 7A–D). At E16.5, this asymmetry in the ventro-dorsal expression of cyclin D2 decreases, as fewer cells now express cyclin D2 in ventral retina (Fig. 7E). In contrast to the ISH results, immunostaining revealed that cyclin D2 protein is nuclear rather than at the basal surface, with cells expressing the highest levels of cyclin D2 positioned more basally. These distinct cyclin D2 mRNA and protein expression patterns have been similarly reported in cortex (Tsunekawa and Osumi, 2012). Cyclin D2+ cells that showed positive staining for Zic2 and Islet1/2 were very rare, indicating that cyclin D2 is expressed predominantly in cells that are situated in the periphery of VT retina, adjacent to the zone of Zic2-expressing cells, and do not yet express markers of differentiated RGCs such as Brn3 or Islet1/2. The finding that cyclin D2 is enriched in the ipsilateral RGC population in our microarray analysis and subsequent confirmation by ISH may reflect the perdurance of mRNA expression in differentiated ipsilateral RGCs. The downregulation of cyclin D2 protein expression in differentiated RGCs that express Zic2 and Islet1/2 may be additionally explained by posttranscriptional regulatory mechanisms. Cyclin D2 is enriched in the ventral peripheral retina during the temporal window of ipsilateral RGC genesis. IHC in coronal cryosections of E11.5 (A), E12.5 (B), E14.5 (C), E15.5 (D), and E16.5 (E) retina. Cyclin D2 is expressed in the lens and the retinal marginal zone bordering RGCs (labeled with Brn3). Cyclin D2 is highly expressed in the ventral periphery compared with the dorsal periphery within neural retina (white arrows). The cyclin D2 and Brn3 domains are separated by a large gap at E11.5 (A). At E13.5 (B) and E14.5 (C), cyclin D2+ cells intermingle with Brn3+ RGCs only in ventral retina (yellow arrows point to boundary) and have sharp boundaries in dorsal retina. At E16.5 (E), cyclin D2 expression is reduced in the retinal periphery and is no longer asymmetric in dorsal and ventral retinal (white arrows). Scale bars, 100 μm. In contrast to cyclin D2, cyclin D1 expression is homogeneous throughout proliferating regions in the retina (data not shown). Cyclin D2+ cells are also positive for cyclin D1. The broad expression of cyclin D1 is consistent with its role as the major D cyclin in retinal development required for general retinal histogenesis (Sicinski et al., 1995; Fantl et al., 1995). The additional expression of cyclin D2 in a specific subset of cells within the retina, however, suggests that it conveys an added layer of regulation on the cell cycle kinetics of these cells. The increasing availability of transcriptomic technologies within the last decade has facilitated high-throughput identification of gene expression profiles that define distinct cell types (Trimarchi et al., 2007; Okaty et al., 2011; Goetz and Trimarchi, 2012; Mizeracka et al., 2013; Islam et al., 2014; Sümbül et al., 2014; Macosko et al., 2015; Molyneaux et al., 2015; Mullally et al., 2016; Shima et al., 2016). Here we have applied DNA microarray analysis to RGCs projecting ipsilaterally and contralaterally during embryonic development. By combining retrograde labeling and cell sorting, we were able to overcome the challenge of isolating a disproportionately sparse neuronal subtype—the ipsilateral RGC population (3–5% of total RGCs in mouse retina)—and then compared the molecular identity of this population with their contralateral countertypes. These gene-profiling experiments confirmed genes known to be unique to ipsilateral or contralateral RGCs and allowed us to uncover nearly 300 genes that are differentially expressed in these two populations. A number of these genes were subsequently confirmed by endogenous expression in developing retina, thus having high biological relevance. In particular, the new RGC markers expressed solely in contralateral RGCs that we identified fill a significant void, as most genes that have been previously described as important for contralateral RGC function are not exclusively expressed in these cell types but rather are also expressed in ipsilateral RGCs. Among the differentially expressed genes we identified, we have found at least one pair, Igf1 and Igfbp5, that show complementary expression within contralateral and ipsilateral RGCs, respectively, and may represent one of numerous signaling pathways that play a role in determining ipsilateral versus contralateral RGC identity. Finally, we have confirmed the expression of several genes that mark “immaturity” in both ipsilateral RGCs and cells within proliferative zones of the retina. These findings suggest that the ontogeny of ipsilateral and contralateral RGCs and the mechanisms that regulate their differentiation are more diverse than previously expected. Our gene profiling experiments reveal that ipsilateral and contralateral RGCs have distinct molecular signatures and can be distinguished during development not only by their axon guidance programs but also by many genes uncovered in our screen that play diverse functions in growth, differentiation, and fate specification. To date, the only known specific markers of contralateral RGCs are the LIM homeodomain transcription factor Islet2 and the Pou-domain transcription factor Brn3a (Pou4f1). However, loss of Brn3a does not influence RGC axon laterality (Quina et al., 2005), and whereas Islet2 is important for contralaterality in late-born VT RGCs, it is not required for the major contralateral projection from extra-VT retina (Pak et al., 2004). Moreover, Islet2 is expressed in only a subset of contralateral RGCs. Thus, a transcription factor that specifies contralateral identity throughout the retina has not yet been identified. Our microarray study has revealed a number of different transcription factors that may fill such a role as a transcriptional regulator of contralateral RGC identity. Together, Igf1, Fgf12, Tbx20, and Sema3e represent four new contralateral RGC markers during the peak period of RGC axon outgrowth. None of these genes have been studied in the context of RGC development. Tbx20 functions in heart development (Plageman and Yutzey, 2005) and cranial motor neuron migration (Song et al., 2006). The expression and guidance roles of semaphorin family members have been demonstrated at multiple points along the path of retinal axons (Callander et al., 2007; Kuwajima et al., 2012). Sema3e is known to be expressed at the optic chiasm (Sakai and Halloran, 2006), where it influences midline crossing decisions in the fish optic chiasm. Here, we show that it is also expressed in a subset of contralateral RGCs, raising the question of why this repulsive guidance cue is also expressed by RGCs. One possible explanation is the demonstration that RGC-secreted Sema3e regulates retinal angiogenesis through interactions with Plexin-D1 expressed on endothelial cells of sprouting blood vessels (Callander et al., 2007). However, whether Sema3e has a further function in regulating contralateral RGC axon growth and guidance has not been explored. Furthermore, the expression of Tbx20 and Sema3e in a mosaic pattern in central retina suggests that both genes may mark a functional subtype of contralateral RGCs that is present only in central retina or in a subset that arises later in development. Alternatively, Tbx20 and Sema3e expression may be delayed in RGCs and thus only seen in the oldest RGCs present at this age, with those in central retina being the first to develop. Consistent with both of these explanations, both Sema3e and Tbx20 are not yet expressed in RGCs at E13.5 (data not shown). We have also found that Igf1 and Fgf12 are upregulated in contralateral RGCs. The Igf and Fgf signaling pathways have broad mitogenic and cell survival effects during development, tissue repair, and tumor growth. Interestingly, unlike most secreted FGF family members, Fgf12 localizes to the nucleus (Smallwood et al., 1996), and thus may play a cell-autonomous role in RGCs. Igf1 is enriched in contralateral RGCs, whereas Igfbp5 is enriched in ipsilateral RGCs. Further suggesting the complementary expression pattern of these two genes, the most peripheral DT RGCs that lack Igf1 expression, express Igfbp5. However, because this observation was made correlatively by comparing ISH for these two genes on different retinal sections, definitive demonstration of mutually exclusive expression would require double-ISH within the same sections over different developmental time points. Although Igfbp5 is the only Igf binding protein detected by this microarray study, another Igf peptide, Igf2, was enriched in the ipsilateral RGC population. Igf2 has been previously reported as a gene preferentially expressed in peripheral mouse retina (Trimarchi et al., 2009). Igf1 has also been implicated in neuronal circuitry formation by promoting axon outgrowth in corticospinal motor neurons (Ozdinler and Macklis, 2006) and by acting as a chemoattractant that directs olfactory neuron axons to innervate the lateral olfactory bulb (Scolnick et al., 2008). Insulin receptor signaling has also been implicated in synapse maturation and density within the Xenopus retinotectal circuit (Chiu et al., 2008). More recently, Igf1 has also been shown to promote αRGC-specific regeneration after axotomy (Duan et al., 2015). With its expression of multiple Igf signaling pathway proteins in distinct RGC populations, the developing retina offers an excellent opportunity to study the roles of these genes in neuronal development: in particular, the function of the complimentary genes Igf1 and Igfbp5 in defining the ipsilateral and contralateral RGC population or sectors of the retina. One highlight of our gene profiling results is that ipsilateral but not contralateral RGCs express multiple transcription factors, such as Math5 and Sox2, known to be expressed in retinal progenitor cells (Xie et al., 2014). Two possible explanations for these observations are that (1) Zic2+ RGCs are developmentally less mature than their contralateral counterparts, and failure to downregulate these genes reflect their immaturity, and (2) these progenitor cell markers have additional functions in postmitotic Zic2+ RGCs and neuronal subtype identity and function. Indeed, several recent studies suggest that neural progenitor genes also have distinct functional roles in postmitotic neurons. Expression of early eye field transcription factors has been shown in both retinal progenitors and differentiated retinal cell types. For example, Pax6 is expressed in both retinal progenitors and RGCs and has a functional role in postmitotic RGC axonal guidance (Hsieh and Yang, 2009; Sebastián-Serrano et al., 2012). 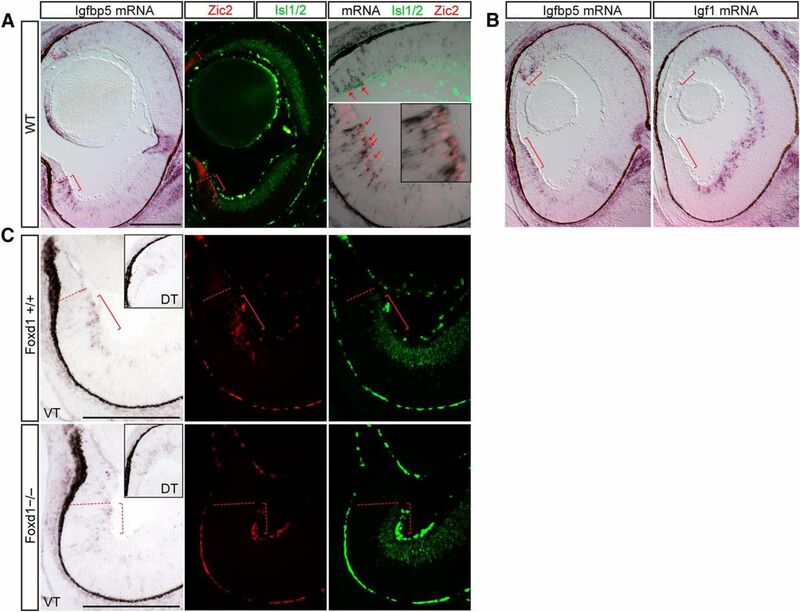 Similarly, although Sox2 is traditionally thought to maintain neural progenitor identity (Graham et al., 2003), it has also been demonstrated to play a role in neuronal differentiation (Cavallaro et al., 2008, Heavner et al., 2014). In the retina, complete Sox2 ablation leads to dramatic loss of neural progenitors; however, reduction of Sox2 expression in hypomorphic or null compound heterozygotes leads to maturation defects specific to RGCs, whereas other cell types are mostly unaffected (Taranova et al., 2006). Expression of progenitor genes in ipsilateral RGCs can be caused by perdurance of progenitor mRNAs in postmitotic RGCs and may simply reflect the relative neoteny of ipsilateral compared with contralateral RGCs. Alternatively, this expression may suggest that ipsilateral RGCs derive from a progenitor pool at a different competence, or differentiation, stage. Thus, the temporal control of neuronal differentiation may be a specific feature or regulator of ipsilateral versus contralateral RGC fate. In this vein, the same VT region that gives rise to ipsilateral RGCs during earlier retinal growth switches to generating contralaterally projecting RGCs after E16. The importance of timing in controlling fate specification of cell class in the retina (Livesey and Cepko, 2001) and elsewhere in the CNS (Caviness et al., 2003), as well as divergent of the same subclass (Imamura et al., 2011), supports this hypothesis. Cell cycle regulation in control of RGC subtype differentiation: a role for cyclin D2? In support of the preponderance of early genes expressed in ipsilateral RGCs and ventrotemporal retina, we found that cyclin D2 is enriched in ventral retina, although not exclusively expressed there. One potential mechanism for controlling the timing of cell cycle exit and differentiation is through differential expression of cell cycle regulators (Dyer and Cepko, 2001; Ross, 2011). Thus, the finding that cyclin D2 is expressed within the VT RGC zone is particularly interesting. Cyclin D1 is the G1 cyclin expressed throughout most of retinal development (Sicinski et al., 1995). Although the expression of cyclin D2 in the peripheral margin of the retina has been previously shown as part of large-scale expression analyses (Glickstein et al., 2007; Trimarchi et al., 2009), none of those studies dissected out the changes in cyclin D2 expression along the dorsoventral and nasotemporal axes. Unlike the microphthalmia seen in the cyclin D1–null mouse (Fantl et al., 1995; Sicinski et al., 1995), no gross retinal phenotype has been identified in the cyclin D2–null mouse (Sicinski et al., 1996). Studies in cortical, cerebellar, and spinal cord development have demonstrated a cell type–specific dependence on the different cyclin D family members, in particular cyclin D1 versus D2 (Huard et al., 1999; Lukaszewicz and Anderson, 2011; Ross, 2011; Petros et al., 2015). Thus, the distinct expression patterns of cyclin D1 and D2 in retinal development, and the close juxtaposition of cyclin D2 with the highly specialized subpopulation of RGCs projecting ipsilaterally, hint at a potential function of cyclin D2 expression in ipsilateral RGC production. In support of this, we observed an intermingling of cyclin D2+ cells with Brn3+ RGCs at E13.5 and E14.5 (Fig. 7B, C, yellow arrows) within ventral but not dorsal retina, where the two expression domains have distinct boundaries. This overlap in the cyclin D2 and RGC domains raises the possibility that the Ccnd2+ cells within this overlapping domain are in the process of differentiating into Brn3+ RGCs. Importantly, asymmetry in cyclin D2 expression is apparent only from E11.5 to E15.5, before or during the period when the majority of ipsilateral RGCs are produced, and no longer at E16.5, when ipsilateral RGC production wanes. Thus, the tightly regulated spatiotemporal expression pattern of cyclin D2 within the murine retina is highly suggestive of a population of cyclin D2–expressing progenitors that gives rise to ipsilateral RGCs. These possibilities are being addressed by ongoing studies in our laboratory. Prior studies in the albino mouse model have shown that changes in the timing and rate of cell production within the ventrotemporal retina lead to a decrease in ipsilateral RGC production (Bhansali et al., 2014). However, the molecular pathways that regulate this rate remain to be determined. The concerted action of cyclin D1 and D2 on cell cycle exit and length could confer one such regulatory mechanism. The developmental roles of the many genes differentially expressed in ipsilateral and contralateral RGCs will be revealed only through further gain- and loss-of-function experiments, through the use of mutant mouse models or overexpression and knockdown studies by in utero and ex vivo electroporation (Petros et al., 2009a). However, the transcriptomic data and in vivo expression studies we present themselves provide novel insight into the development of ipsilateral and contralateral RGCs and the mechanisms through which neuronal diversification can be accomplished in the retina. Additional studies using similar retrograde labeling and cell sorting approaches to isolate ipsilateral and contralateral RGCs in mature retina can further elucidate how these two cell types are molecularly and functionally distinct beyond development, after injury, and in regeneration. Moreover, our use of rapid retrograde labeling ex vivo to isolate projection neurons that have not yet reached their targets can be applied to the purification of other neuronal subtypes during embryonic ages. Acknowledgments: We thank Takaaki Kuwajima for help with retrograde labeling experiments, Mika Melikyan for mouse breeding and genotyping, Alexandra Rebsam (INSERM, Paris) for advice on gene profiling experiments, Fiona Doetsch and lab for advice on microarray analysis, Paola Arlotta (Harvard) for advice in the early stages of ISH probe design, and Jane Dodd and members of the Mason lab for discussion and comments on the manuscript. Supported by NIH grants R01 EY012736 and EY015290 (CM) and T32 GM07367 and EY013933 (QW) and Fight for Sight (FM). Glickstein S, Alexander S, Ross M (2007) Differences in cyclin D2 and D1 protein expression distinguish forebrain progenitor subsets. Cereb Cortex (NY) 17:632–642. Goetz JJ, Trimarchi JM (2012) Single-cell profiling of developing and mature retinal neurons. J Vis Exp pii: 3824. Hernandez-Bejarano M, Gestri G, Spawls L, Nieto-Lopez F, Picker A, Tada M, Brand M, Bovolenta P, Wilson SW, Cavodeassi F (2015) Opposing Shh and Fgf signals initiate nasotemporal patterning of the zebrafish retina. Development 142:3933–3942. Jin K, Xiao D, Andersen B, Xiang M (2015) Lmo4 and other LIM domain only factors are necessary and sufficient for multiple retinal cell type development. Dev Neurobiol 76:900–915. Kay J, de la Huerta I, Kim IJ, Zhang Y, Yamagata M, Chu M, Meister M, Sanes J (2011a) Retinal ganglion cells with distinct directional preferences differ in molecular identity, structure, and central projections. J Neurosci 31:7753–7762. Mullally M, Albrecht C, Horton M, Laboissonniere LA, Goetz JJ, Chowdhury R, Manning A, Wester AK, Bose Q, Trimarchi JM (2016) Expression profiling of developing zebrafish retinal cells. Zebrafish 13:272–280. Petros T, Rebsam A, Mason C (2009a) In utero and ex vivo electroporation for gene expression in mouse retinal ganglion cells. J Vis Exp pii: 1333. Decisions are customarily a result of the Reviewing Editor and the peer reviewers coming together and discussing their recommendations until a consensus is reached. When revisions are invited, a fact-based synthesis statement explaining their decision and outlining what is needed to prepare a revision will be listed below. The following reviewer(s) agreed to reveal their identity: Robert Hindges, Harald Hutter. In this manuscript the authors describe a differential expression analysis identifying genes enriched in either ipsilaterally or contralaterally projecting RGCs. They confirm their data with qPCR experiments and characterize the retinal expression of selected genes using in situ hybridization and antibody staining. The study identifies a large number of differentially expressed genes and provides a starting point for a functional characterization of those genes. The experiments are well documented and support the conclusions. I agree with the reviewers' conclusions that the screen provides an interesting starting point for future studies. The method used in this study to identify ipsi- and contralaterally projecting RGCs by dextran labeling allows for the unequivocal selection of the respective cell populations as a source for differentially expressed genes. However, I also share their concerns that the validity of the approach has suffered from the fact that the two pools of cells (ipsi- versus contra) have not been treated in the same manner. This fact likely distorts the relative abundance of differentially expressed genes. Still we feel that the data provide an important resource for others interested in (the function of) differentially expressed genes in the retina. Therefore, we suggest that you comment on this caveat in the manuscript along the lines suggested by reviewer 1. In general, the work could provide a useful list of different markers that are differentially expressed between these cell populations. However, I have a concern regarding the set up of the experiments. The authors state that they had to amplify the cDNA from the ipsi population, due to the low numbers of cells recovered. Does that mean no amplification was carried out for the contra population? If this is the case, the two samples (ipsi vs contra) are not comparable without problems, due to the different preparations. Although some of the known markers for ipsilateral-projecting RGC are correctly found in the dataset, it could be that many others in the list are not real. This could also be a possible reason why so many specific genes have been found for the ipsi population in comparison to the relatively low number for the contra population. A possible approach would be to reduce the number of contralateral projecting RGCs (maybe from the peripheral region, to "correct" for the different developmental stages between central and peripheral RGCs) and do similar amplification protocols for all samples. The expression images for Sema3e and Igf1 show also reduced/absent expression in the dorsal periphery. The authors explain this by suggesting that these RGCs have not yet accumulated as much of the transcript as the more central RGCs. Could it be that this also is true for the peripheral RGCs in the ventral retina? The authors suggest a complementary role (and expression domain) of Igfbp5 and Igf1. However, from the images shown it looks like that the Igf1 positive area in the periphery is much larger than the region positive for Igfbp5. Have the authors tried to do two-color ISH for these markers to show their expression domains in the same tissue? If this is difficult, maybe adjacent sections for the two different probes could help. The authors show that Igfbp5 is reduced in VT retina of Foxd1 knock out mice. However, they do not show what happens to the DT expression domain. This should be included as a control to show the specificity for the ipsilateral RGCs. The authors describe an asymmetrical expression of Ccnd2 between dorsal and ventral retina. However this is very difficult to see in the ISH image given. "In total, 299 genes (404 probe sets) were found to be enriched in ipsilateral RGCs and 40 genes (47 probe sets) in contralateral RGCs, using a 2-fold cutoff (Fig. 2), suggesting that an extensive genetic program is activated to generate ipsilateral RGCs." The authors seem to suggest here that ipsilateral cells are more distinct than contralateral cells in their expression profile (299 upregulated genes versus 40 genes). However the authors concede that they might have missed an (unknown) number of contralateral genes (they mention Islet2 as an example), because contralateral cells are heterogeneous (e.g. Islet2 is expressed only in a subset of contralateral cells). It is therefore not clear to me, whether the observed difference (299 versus 40 genes) is meaningful. The authors should make it more explicitly clear that contralateral RGCs are heterogeneous in their expression profiles, which leads to an underestimation of contralateral enriched genes. "Of the 7 new contralateral genes tested, the following genes showed exclusive expression in contralateral RGCs (Islet1/2+Zic2- cells)"
The authors should comment on why these 7 genes were selected for further analysis. It looks like an arbitrary selection. "Cyclin D2+ cells that showed positive staining for Zic2 and Islet1/2 were very rare,"
According to earlier statements by the authors the cells used for expression profiling express both Islet2 and Zic2. The authors find Cyclin D2 enriched in those cells by microarray analysis. I would therefore expect that immunostainings of retina show Cyclin D2 co-expressed with Zic2 and Islet2. Apparently this is not the case (see quoted statement above). I find this rather puzzling. The authors should comment on this. According to the microarray data, Cyclin D1 is also enriched in ipsilateral cells (3.88 FC, see table 2-3). However the authors claim that: "In contrast to cyclin D2, cyclin D1 expression is homogeneous throughout proliferating regions in the retina (not shown)." This seems to contradict the enrichment seen in the microarray experiments. The authors should comment on this. There is no good correlation between microarray and qPCR data with respect to fold-change (FC). E.g. zic1 and zic2 show a similar FC in microarray data but very different FCs in qPCR experiments (6 for Zic1 versus 64 for Zic2). The authors should discuss this discrepancy.